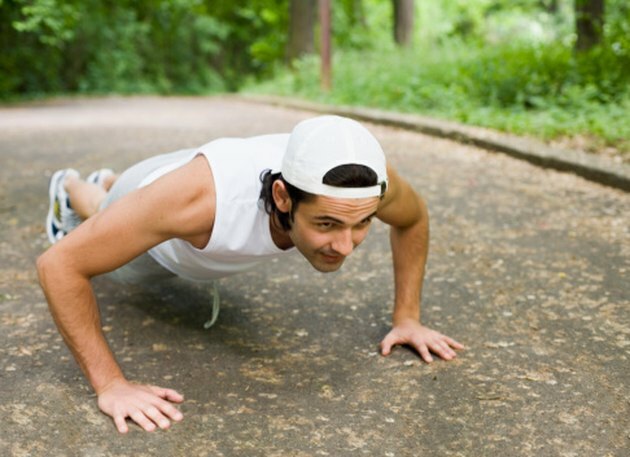 Pushups are a fundamental exercise that target several muscle groups in your upper body. One of the many benefits of pushups is that you can change the feel and emphasis of the exercise simply by adjusting the position of your hands. Although diamond and wide-grip pushups are very similar exercises, they target different muscles. Diamond and wide-grip pushups have the same basic form with different hand positions. With your hands flat on the floor, extend your legs behind you. Your body should be a straight line from your shoulders to your ankles. For a wide-grip pushup, you place your hands flat on the floor, just outside your shoulders. A diamond pushup is a type of close-grip pushup. Place the tips of your pointer fingers and the tips of your thumbs together. This should create a diamond-shape between your hands. A diamond pushup and a wide-grip pushup have the same basic movement pattern with minor, but important, distinctions. For a wide-grip pushup, you lower yourself to the floor by bending your elbows, letting them flare out to the sides. For a diamond pushup, as you descend, keep your elbows pulled in close to your sides; don't let them flare out as in a standard or wide-grip pushup. Both wide-grip and diamond pushups target your chest, triceps and front shoulder muscles. However, each type of pushup emphasizes these muscle groups differently. A wide-grip pushup mainly works your chest and front shoulders with your triceps assisting. A diamond pushup targets your triceps first and your chest and shoulder muscles second. Any style of pushup where you move your hands closer and tuck your arms close to your sides transfers the stress to your triceps. Besides targeting the muscles of your upper body differently, the diamond pushup is a more challenging exercise than a wide-grip pushup. Pulling your hands in so close together presents a balancing component that doesn't exist for a wide-grip, or even a standard pushup. Your triceps are much smaller and weaker than your chest muscles. Pushing the same weight – your bodyweight – with a smaller muscle is more difficult. You can perform either a wide-grip pushup or a diamond pushup on your knees to make the exercise easier.